This rich, delicious One Bowl Chocolate Cake (from scratch) is perfect for every occasion and won’t leave your kitchen a wreck because you only mess up one bowl! Okay, it’s no secret that I don’t bake from scratch with the majority of my cake decorating ventures, but that doesn’t mean I don’t like to bake from scratch or that I can’t bake from scratch. I’ve been accused of that by the way – not really being a baker at all because I use cake mixes. Um, those have to be baked too people. Just sayin’. But seriously, I just do what works for me and most often in my cake decorating business, that means doctored up cake mixes. I’m happy and my clients are happy, so I’m not sure why others have such a beef with it. Anyway, that aside, my best friend Kathy recommended this One Bowl Chocolate Cake recipe to me way back in 2011 (I know because I still have the email) and it’s been my most favorite from-scratch chocolate cake recipe ever since. It’s so super moist and delicious! And easy… you literally only mess up one bowl for the entire recipe. Better yet, it’s never failed me a single time!! Just last week Kathy and I were talking about how there are certain from-scratch recipes that work perfectly one time and totally flop the next and there’s never any way to know when you’ll have a success or failure. This cake is not like that. It has always worked for me! I’ve made it as a sheet cake, round cakes and cupcakes and it’s always perfection! For this particular cake pictured, I double the recipe, used some for cupcakes and then baked three 8″ round cakes to stack up and layer! Normally it’ll only be enough batter for two 8″ or 9″ round pans, or one 9″x13″ sheet cake. 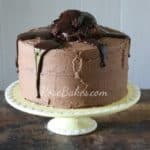 My favorite way to eat this cake is just to top it off with poured ganache and call it a day because it’s simply delicious and perfect that way. But the day I made this cake for these pics, I chose to make some more Brownie Batter Frosting to put on top of it. And then I added some cubed up brownies (leftover brownie mix from the frosting put to good use). And then… then I put on the ganache. It was all that and more! As I was writing this, I found one more picture of this cake covered with ganache then fresh whipped cream. I snapped this picture when there were only a couple of slices left. But I clearly remember that day… this cake is just mouth-watering, lick the cake plate good. Okay, that’s enough blabbing. Here’s the recipe! Make it soon! Love chocolate? Check out this Chocolate Peanut Butter Fudge from How to Make Easy Fudge. One Bowl Chocolate Cake from AllRecipes.com. UPDATE: Several of you pointed out that this is the original Hershey’s “Perfectly Chocolate” Chocolate Cake. I guess I’ve never read the side of a Hershey’s Cocoa box before because I’d honestly never heard of this before. This rich, delicious chocolate cake is perfect for every occassion and won’t leave your kitchen a wreck because you only mess up one bowl! Preheat oven to 350° F. Prepare two 8″ or 9″ round pans (or I’ve also used a 9″x13″ sheet cake pan). You can either grease and flour the pans, use non-stick cooking spray, or use homemade cake pan release. In a large mixing bowl, mix together the sugar, flour, cocoa, baking powder, baking soda and salt. Make a well in the center of the dry ingredients and add the eggs, oil, milk and vanilla. Beat for 2 minutes at medium speed, then stir in the boiling water. Pour into the prepared pans and bake for 30-35 minutes, or until a toothpick comes out clean. Allow them to cool for 10 minutes in the pan, then flip them out on a wire rack and let completely cool before frosting. 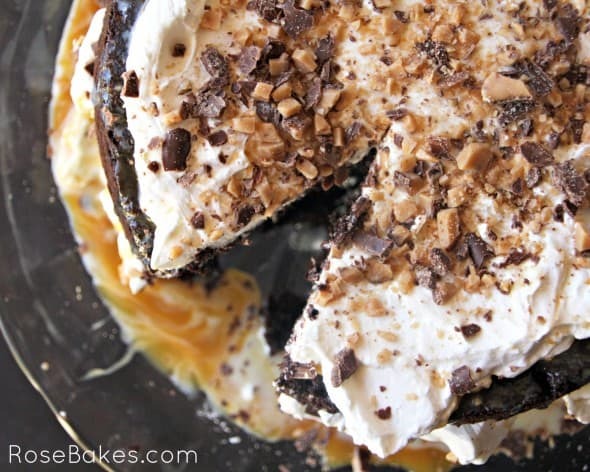 I’ve never heard of the Hershey’s recipe, but if this is it – WOW – it’s perfect!! Oh, I agree wholeheartedly!!! Yum!! And then I’ve discovered if you sub half the milk with sour cream and add 1/4 tsp. baking soda, you have an amazing sour cream chocolate cake!! Oh my!! I just made 86 cupcakes yesterday with that chocolate sour cream recipe!! I love this recipe but it is delicate. If the layers are not chilled it makes it hard to frost with icing. How would I make it a little bit denser? Less/More baking soda or baking powder? 1/4 tbs. pus the regular amount r ny 1/4 tbs.? Do you also make the frosting? Do you gave a recipe for that? I would love to make this cake on Saturday for my birthday. Thanks! Rose, I made this cake yesterday for my husband for his birthday. I was a little nervous due to the fact that is was so loose of a mixture. Usually cake batter is thicker. But I did see other comments so I went ahead and baked it. I have to say I will NEVER use another Chocolate Cake Box mix again. This cake was totally awesome and so easy. Thanks for the recipe. Hello! I’m impressed by how easy this recipe is and will try to make it as my first-ever customer order 🙂 However, i was requested an all-buttercream-flower covered cake. would the consistency of the cake help? I’ll cool it before covering with the first layer then cool the layer again before handling the decoration. Do you think it will work? OMG some people can be so ridiculous! Fresh baked cake!!! Haha, I bet when they make a cake it’s not from scratch all the time if ever. Do they know that if they order a cake from a store bakery that the cake is not made there ony decorated there! I know I’ve worked in a store with a bakery for 18 years and not one cake was ever made at the store they are all shipped in frozen and the people always said we had the best fresh cakes around and when they asked if it would be baked the morning of the pick-up I would tell them they are not baked there only decorated there. Look around people do you see big blenders or big ovens to make your cake from scratch…. get a grip this is a fast moving world. they don’t do things from scratch anymore. Sorry just had to vent… it just amazes me how some people are. I don’t have a problem with boxed cakes; it’s just a personal preference for me. I have a home based baking business and make special ocassion cakes, including wedding cake and they are all made from scratch. I get asked if I use boxed cake or do I bake solely from Scratch and I am happy to say Scratch. by the way, THIS IS my scratch chocolate cake recipe. It’s the best. Yes!! That’s how it should be. I’m so glad you cleared that up! I was already like “Omg, I ruined the cake… But I followed instructions :/” thanks! Mary L. I’m so glad that you threw that out there! I know that there are a lot of bakeries that do make items from scratch, but I do know for a fact that even our grocery store doesn’t even make the morning donuts. I found out from an employee that they are brought in frozen from “elsewhere” and heated. Tastes great! I’ve made it twice now in sheet cake and layered cake form. Both times the center kind of “sunk” in when it was finished cooking. Not a smooth round finish. Any idea what I can do to fix that? Love how it tastes so I want to perfect the look now. Thanks! I’m gonna be making a few of these later but I’m gonna do a mini bundt cake with booze also a regular size bundt will I have a problem with not making in a regular pan? I got all excited to see a new one bowl chocolate cake recipe to add to my collection…and it’s the same recipe I use! This truly is a never fail ultimately delicious cake. Now I feel like baking…. I love the doctored cake mix cakes and so does my family. With that said, I am going to have to make this one….like this week! Looks so good. BTW.. I made the brownie batter frosting last week and it was a HUGE hit! You’re welcome Jeanne! I really hope you love it as much as we do!! Could I use butter instead of vegetable oil? Doesn’t the boiling water cook the eggs? I don’t know if the butter substitute would work. No, the boiling water does not cook the eggs! I’m stopping by from SITS and pinning your post to a The Creative Mama pinterest board. 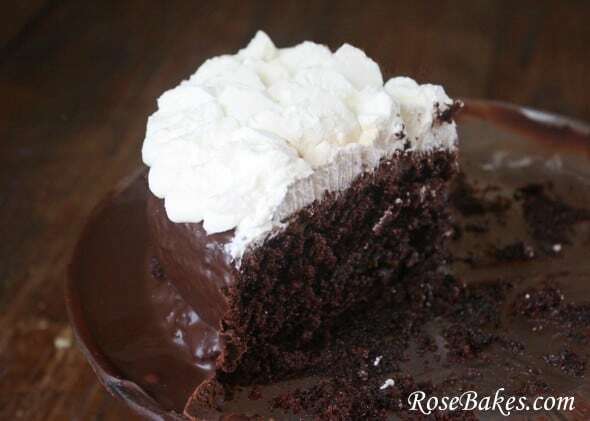 This looks like a great chocolate cake and easy enough to not miss the boxed cake mix. I especially love your photography and the variety of angles you used. Beautiful! You’re right Julie It is the Hershey’s cake recipe. Use the Hershey’s Dark and it gets even better. Glad to see that others like the recipe as much as I do. It is truly a no fail, delicious from scratch chocolate cake. Thanks! I’m a true chocoholic I love your recipes. 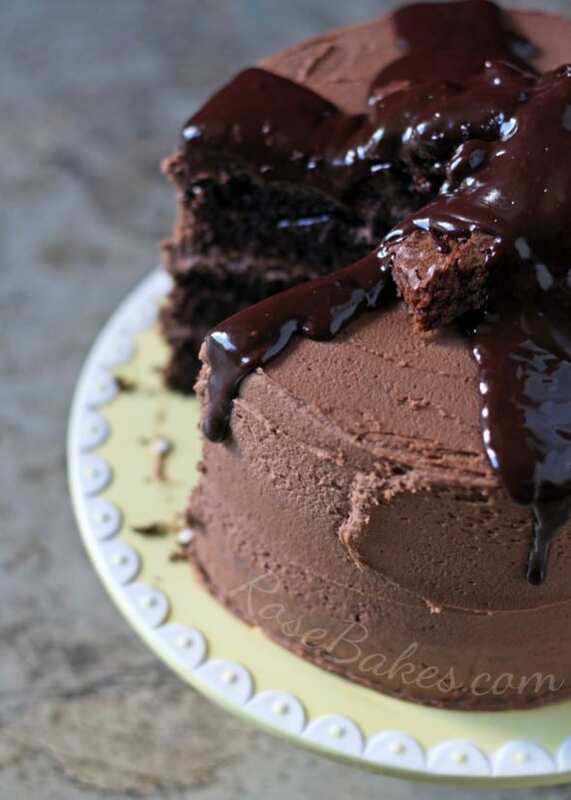 Thanks for posting this one bowl chocolate cake recipe. I tried it 2 days after I saw the recipe and took it to work and everyone devoured it. I just covered it in choc ganache. It is SOOO moist and light and delicious. I’ve made it 3 times now. I also substituted the cocoa for flour and then added raspberry coulis to the mix plus a cup of chopped raspberries (frozen) to make a light raspberry cake. Just needed a splash of red gel colour 🙂 it turned out great as well. My batter is watery. Is that okay? Yes, the batter for this recipe will be really loose! Just put this in the oven and was worried about the runny batter. Decided I should check to make sure they wasn’t an update. Glad there wasn’t! Can’t wait to eat it. 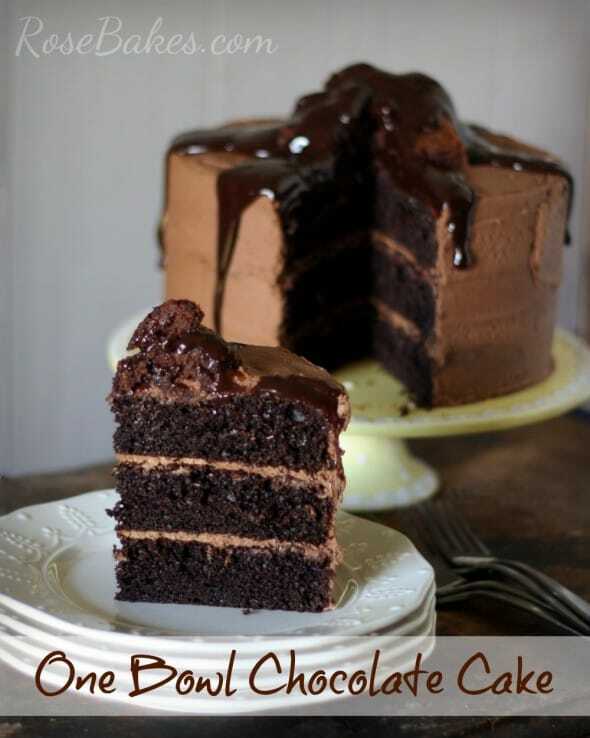 Chocolate cake with chocolate frosting is my FAVORITE! I am new here but I have a question. I am getting into decorating cakes to sell. I found your information on this website very helpful1 Thank you! My question is, Which of you cakes are sturdy enough to hold up to decorating with fondant ect? Chocolate and vanilla? Any of my cake-mix based recipes here on the site are great for decorating. I use this vanilla cake, chocolate cake, white almond sour cream, and strawberry cake. Help!!! This cake look so good, that I decided to make it! But, It didn’t turn out right… I’m new at baking, and I didn’t have two pans, so I put all the dough in a tall 9″ round pan, since I used only one pan for the recipe, I decided to leave it baking for one hour (double the time)… It looks beautiful, but a little dry… Any advice? PS The frosting and the ganache turned out delicious!! I love all your cakes! I just finished making the cakes and found the batter to be really runny. Is this normal? Yes! It’s a very runny batter! Do you think this can be used as a two tier wedding cake? Not that this is at all relevant at this point, but you should be able to make it happen by putting wooden dowels into the center of the bottom cake. I like to use dowels that are high enough to push half way (or a littler more) through the top tier. You can have a hardware store cut them to an exact length, or you can just find a pack of crafting dowels that will fit your height. Take in to consideration the height of the cakes after they’re filled/frosted. I have had huge success every time i have used this method. I have had terrible failures each time (The one time. (I’m nobody’s fool.)) I did not. They support the weight of the upper cake, makes sense. You wouldn’t build a house without load baring beams. I’m new to your website and was quite excited to see the chocolate cake recipe, only to read on and see it’s the one I make. So yummy that my son who does not eat chocolate loves this cake (without frosting…weird I know) Anyway, just wanted to say thanks for the recipes, insight, tips and humor. You are soooo right, boxed cakes have to be baked too.! HA. What a hoot. Just wanted to know if this cake can be covered with fondant or is it too light and delicate for heavy fondant?? This is the same amazing chocolate cake recipe I use, except I sub hot coffee for the hot water. This really deepens the chocolate flavor! Yum! I really need to try that! Yes!!! That is the one. Thank you so much..
Can I use salted butter? I bought salted butter by accident instead of the unsalted. Awww, I’m too slow on replying to comments this morning! But yes, I often forget to buy unsalted butter and this recipe still works beautifully with salted! SO glad you like the cake! I’m making this right now! I made a few mini cupcakes with some of the batter so I could test it! And it’s delish!! I made it dairy free (used rice milk instead of milk) and egg free (1.5 bananas) and decaf coffee instead of the boiling water! Great recipe Thx! Are the ingredients in this recipe for a triple-layered cake? So if i only want a single-layered cake, do I have to divide everything by 3? Sorry that it’s a silly question, I’m just a beginner in baking. Theoretically that would work, but often recipes don’t react well to being cut down or multiplied. I haven’t tried it so I don’t know for sure… you’d just need to do a trial run. I made this for my niece’s wedding shower this past weekend. I was a bit worried as I poured the batter into the pans – it was very thin and runny. However, as it baked, the rich chocolate smell that filled my house was AMAZING. 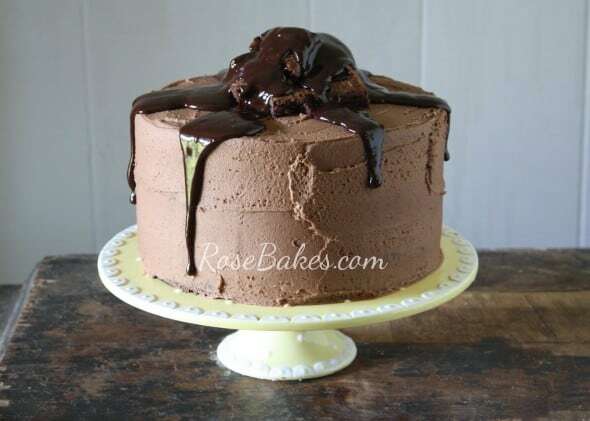 I iced it with chocolate buttercream – it was a massive four layer cake! Rave reviews from everybody! I swear it got better a few days after as the buttercream settled into the cake. Definitely one I will be making again…and again and again and again! hi. I love to bake. The last few times I’ve baked though, the recipe has flopped because of SOMETHING I’ve done. A few questions on this recipe: how do I adapt this recipe to cupcake? What time in oven? What temp? And does it make 12 or 24 cupcakes? -I don’t change the recipe at all but I only bake them for 18-19 minutes and it probably makes 24-30 cupcakes…. I don’t remember exactly. I tried this recipe but had to substitute for the eggs, two of my kids are allergic. I used soda/vinegar at the very end, but my cakes fell and did not work at all!! I knew it was a longshot, but I was hoping. 🙂 Do you have a chocolate cake…or any cake….recipe that works well without eggs? Thanks!! I do, I do! I have an old family recipe that stemmed from the great depression when dairy and eggs were too expensive for many families. This recipe was published in a newspaper and my husbands grandmother found it, and it’s been a family birthday tradition for the entire family ever since! It’s a MUST try! Promise, it’s delicious!! Preheat oven to 350 degrees. Grease and flour 9×13 cake pan, use parchment in bottom if you plan to remove from pan to frost or decorate. Mix all dry ingredients together, mix in all wet ingredients and mix thoroughly with mixer. Add batter to prepared pan. Bake 35 minutes or until toothpick comes out clean. I like to frost with Hershey’s Perfect Chocolate Frosting for family or chocolate buttercream for decorating. I make 1 and 1/2 the recipe to stack three 8 inch round pans. Try depression cake or wacky cakes. The chocolate one is great and is egg and dairy free! You can substitute 1 tbl. Regular applesauce for each egg and it doesn’t rise as much but still tastes the same! Hi ,I love your posts and look forward to reading what you are doing. i am still searching for that perfect white cake recipe. I love this one bowl choc recipe so much that I wonder if I could turn this into a yummy white cake if I left out the cocoa powder?? Oooh – I haven’t ever tried that, but it might work!? Oooh – it’s been awhile. I think around 30?! But don’t hold me to that! I love this recipe. I halved the ingredients and baked it in an eight inch square pan for 30 minutes. I used coconut oil and it was amazing. It really doesn’t need frosting, a spoon of whipped cream on the warm cake and it’s heavenly. I know this is going to be a family favorite. Thanks for sharing. 🙁 I’m sorry to hear this but I’ve never had that happen and I’ve made this recipe many, many times, including the boiling water at the end! 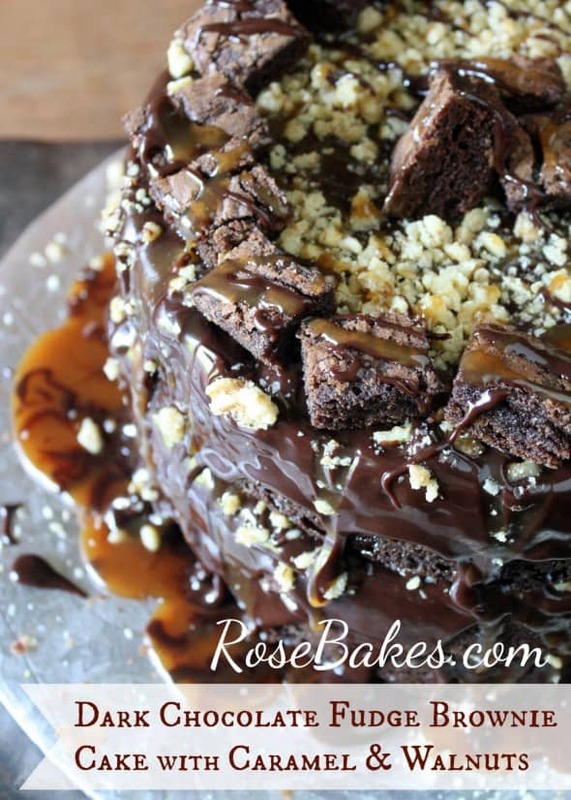 Thank you so much for linking up this chocolate cake. I could lick the screen. 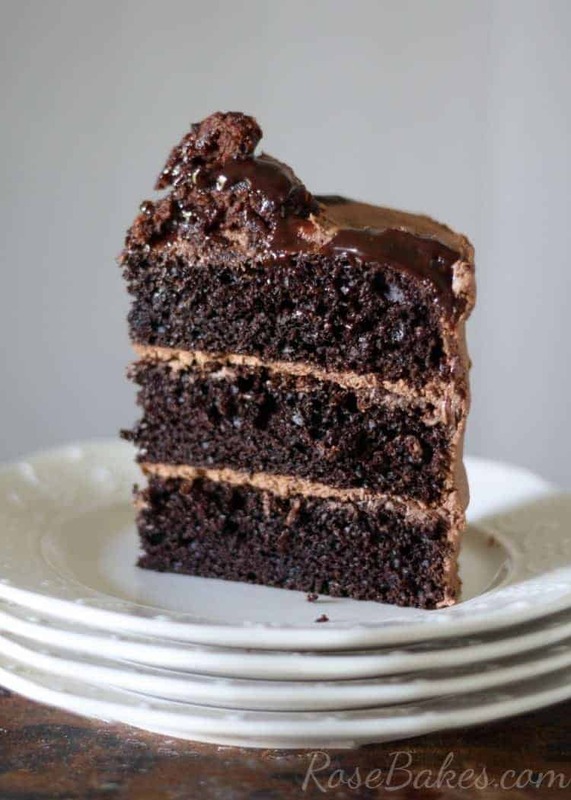 I seriously day dream about chocolate cake. I LOVE IT! I am going to have to try this amazing recipe. This happened to me too! Twice….. minus the fire.. I thought I wasn’t acknowledging how much batter I filled the two round pans with. This time around I made a point to acknowledge it definitely seemed low. I decide to take a look in the oven & find it happened again!!!! This time landing on the heating element which I feared would soon start a fire. I will say the first time I made this cake I used one long rectangular pan and never had the cooking over issue…….. Super sad this has happened twice in the round cake pans. Oops, I got in a hurry and added the hot water with other wet ingredients. Do you think it will turn out well? It’s baking now. Can you use this recipe to make cupcakes? Does anyone know how much to put in each and how to adjust the baking time? I love love love this recipe. It always tastes so great! Yes! I use a 2 Tbsp. cookie scoop to do my cupcakes and I bake them for 18 minutes. Can we use vanilla buttercream frosting over it? Hi Sheena, thanks for stopping by the blog. Yes, vanilla buttercream would go great with this chocolate cake! Hope you enjoy it. 2 Cups equals to how many grams?? Hi Pinky, I assume you’re referring to the sugar measurement. When I looked it up, it says 2 cups would equal about 400 grams. Hope that helps! I think around 24-30 (but I may be remembering wrong). Awesome cake! I’m not a true chocoholic, but LOVE this cake!! 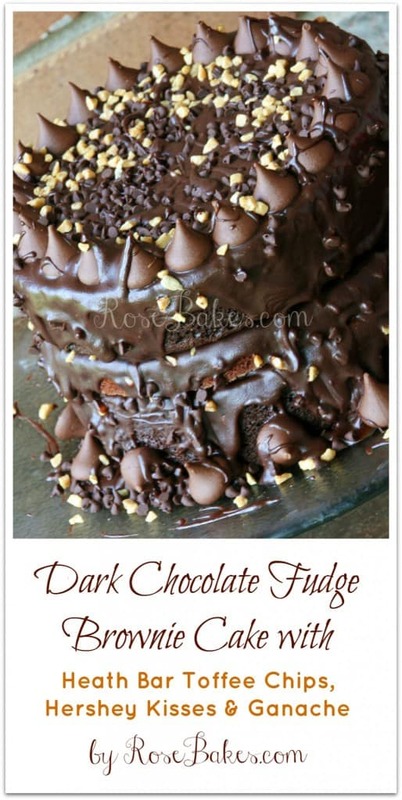 It’s very moist and has the perfect chocolate flavor. This is now my go to chocolate cake. This was so easy, and turned out delicious.So moist and chochlatey. I’m never buying a box cake again. Thank you so much for the recipe. Thanks for stopping by the blog, Alvina! So glad you enjoyed this recipe! Now your chocolate cake should be fluffy and delish cause it’s so similar to my recipe and it comes out perfect all the time and my customers are always happy with it..
Can I bake this in a ceramic oven dish? What would I need to change? How full must I pour in to the dish – eg. 3/4 full, or how much? I didn’t notice the water was supposed to be boiling before I added it. Does it make a difference? Do I need to start over? Eeek, I’ve honestly never done it without the water boiling so I’m not sure how it will affect the recipe. Did it turn out for you? Yes! Thankfully they turned out and were delicious! I ended up making cupcakes with a buttercream icing and raspberry filling. Delish!! I’m new at baking definitely will be trying this recipe. I’m soo excited!! This has been my go to chocolate cake for years….with one change….instead if water….I use a cup of hot black coffee. The coffee gives the chocolate a more intense chocolate flavor…..
Can this cake be made a day in advance, using the brownie frosting? If so, should it be refrigerated? It would probably keep for 2-3 days easily and no need to refrigerate. I’m craving chocolate cake and am just wondering if this could be made in a bundt pan? Would I need to adjust bake time if so? I’m afraid it would be too soft, but I’ve never tried it to know for sure. Hey just curious how many cupcakes this recipe would make? I made this cake on Friday night. Was a little skeptical when the batter was so thin. It baked up fantastic in a 9 x 13 pan. It came out with a heavier fudgy layer on the bottom and the top portion was more cake like. Definitely a keeper. I made a homemade chocolate buttercream frosting and loved the whole thing. Next time I think I will make 1/2 a recipe and use an 8in pan, as much as I love chocolate cake with chocolate frosting a 9 x 13 is a lot for 2 of us to eat. But hey, somebody has to do it! 😉 Thanks for sharing this recipe. Aww, you’re welcome! I’m so glad you loved it as much as I do! This cake is life! I bake the whole batch in one 9-inch round pan and it worked out pretty well (cause I don’t have two of the same size :D). I was able to cut it 3 layers with no problem. The batter is veeeery runny and that scared me a little but it came out awesome. I used it with Oreo frosting Thank you! I have NEVER left a comment on any site about a recipe that I tried. This recipe was AWSOME. I was a little worried because the batter was runny, but when I read the other comments I felt better. I made a chocolate meringue buttercream. I took the cake to my job and everyone loved it. This recipe will definitely be used again. THANK YOU!! Personally I have not used this recipe for big tiered cakes but I’ve read that others have used it with success. I’m sorry I can’t say for sure with first-hand knowledge. Hey Bethan, a cup is a standard measurement – 250 mls. Has anyone baked this in advance and frozen it? I’d like to be able to thaw it then decorate the day before an event. This cake! Oh wow. It’s amazing! I made it for my birthday and it’s so moist and light! This is definitely my new go-to chocolate cake recipe. The batter is very loose and that’s normal. Granted, I’ve never multiplied it to that large of a quantity but it comes out perfect even when it’s super watery! Thank you, i am willingly to try it again without adding extra flour. Did i mention I added 10 more cups to thicken. I find having the batter so moist makes the cake rise really evenly – no need to cut the top off to get flat layers. Home run every single time! People always ask for this recipe. Easy to make. Absolutely delicious! Thanks for stopping by the blog! So glad you and your family enjoyed this awesome cake! Hi do your sieve the flour and cocoa powder? I don’t, but it wouldn’t hurt! You’re welcome Rachel – Happy New Year! As much as I love to bake from scratch I have no problem with a doctored or plain mix. I’ve found that lots of people poo-poo the idea of boxed cakes but sometimes you can’t tell the difference. Also, if I made wedding cakes from scratch I don’t think the price would go over too well. I’m looking forward to trying this recipe, the cake looks delicious. I think I’m dying and going to chocolate heaven this weekend! This looks delicious! I would love for you to share over at the new Let’s Party! https://themarkandjanshow.com/2018/01/31/lets-party-6/ … we look forward to seeing you there! It’s definitely a favorite! Hope you enjoy it as much as we do! Excellent recipe I made this with my daughter for my husbands birthday. I’m not a chocolate cake person but this recipe was so good. Thanks for sharing. This is such a good recipe, I discovered it about a year ago and haven’t made any other chocolate cake since! So simple, quick, and it never fails. Today I brought it for a big work morning tea and had to share this link with 3 other staff. I made it gluten free, using Orgran brand Plain Flour substituted 1:1, and seriously it comes out like a normal chocolate cake; the crumb is perfect (which is rare for most gluten free cakes). Filled it with a coconut butter cream, and topped with ganache. Personally, I liked it better than the big celebration cake we bought from a local pattisserie. I think next time I’ll use more cake release and see if that helps. Hi Zyla, thanks for stopping by the blog. We haven’t tried this, but according to a quick search, you can substitute brown sugar for granulated sugar by using the same amount that is called for for the granulated sugar, however, it may change the texture/flavor since brown sugar has molasses in it. thanks susan.. very helpful. i can bake this cake for special eve “Hari Raya’ soon.. tq so much.. This is a delicious and easy cake! I made it today and we all loved it! Thank you Rose for a great recipe!!! Just made this cake and it had some weird bubble clusters in the center of the cake (almost looked like a cluster of chocolate mold growing, honestly don’t know how else to describe it). Is that normal? No idea why this formed. I’m really looking forward to trying this recipe for my dad’s retirement cake. He loves chocolate! 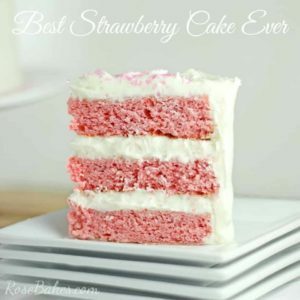 Quick question: the recipe makes 2 8″ or 9″ layers- but in the blog post you made double the recipe which resulted in a 3-layer plus cupcakes. My question is: how many servings does the 3-layer serve and do you remember how many cupcakes the extra made? I wish I could remember Sunny – that’s been quite awhile ago! No worries. Thanks for responding! You sound like a very busy woman. I’m going to double the recipe, make 3 layers and the extra will be cupcakes. I’ll let you know what I come up with! Awesome! Have a sweet day! Ok o m g it smells delish, I made for my grandmother 90th birthday tomorrow so I hope it’s as good as it smells. Also be better with 5 stars if had a recipe for frosting and ganache…. but thank you for a great and easy recipe. Does this cake bake well with the white almond sour cream recipe. I have a cake order for half chocolate and half white and I prefer to bake them in the same pan. Oh goodness – I have no idea if that would work or not. Rose how can you sit here and take credit for someone else recipe (Hershey) your recipe is the same exact as theirs. You sit you and play it off as your own and take credit for it I stead of giving the credit to where it. Really belongs. Not very professional! I made this last night. It was moist but I didn’t think it had very much chocolate flavor to it. I wonder how it would taste without the water added. Thanks. Use Hershey special dark chocolate… this exact recipe shes shared and taking credit for is from Hershey.com themself I can’t believe she’s (rose) is taking credit for a recipe that isn’t even hers. Here’s the same recipe in the link below this who the credit should really be going to for this recipe. I have made this recipe several times and it never disappoints. I have made chocolate mocha buttercream, almond vanilla buttercream and pure chocolate buttercream and, again, it is insanely moist and tender to eat. It is a light as air cake and my husband begs me to make this all the time. I have pneumonia and I’m not feeling good but this is so quick to whip up I hardly had to stay up long to bake and frost it and everyone had dessert even though I am deathly ill.